At times, people come to our monastery with concerns about close friends and relatives who have been diagnosed with schizophrenia, bipolar disease, or some other such disorder. Often they ask, “Is this really mental illness or is it demonic possession?” So, from the practical need to give a helpful response to such heart-breaking questions, we began studying the Tradition of the Church as it is found in the liturgical books, the writings of the Holy Fathers, and the Lives of the Saints. The Church does distinguish between mental illness and demonic possession. The Fathers generally view both the mentally ill and the possessed with compassion and, at times, even with admiration. In the view of the Church, if we aren’t saints, we’re insane. It’s better to be possessed by a demon than to be enslaved by our passions. The reason that it’s better to be possessed by a demon than to be enslaved by our passions is that enslavement to passions is in fact a worse type of demonic possession. Well before the time of Christ, Greek physicians treated people for mental illness. As heirs to this medical tradition, Byzantine physicians did the same. The Church Fathers routinely refer to medical treatment of the insane with no hint of disapproval. In one case (that of “lunacy”), however, they insist that the cause is not physical, but demonic. This seems to be the exception that proves the rule. (Basically, lunacy seems to refer to epilepsy-like symptoms that are associated with certain phases of the moon. The Fathers routinely insist that the demons are causing these symptoms and are timing them purposefully with the phases of the moon to cast the blame on it.) In this one case only, the Fathers take great pains to deny medical causes. In all other cases, they generally accept the physicians’ diagnoses. This confi rms that the Fathers generally believed in mental illness that was distinct from demonic possession. We have yet to find any ancient texts that specifically mention how they distinguished the two. But from contemporary elders’ specific statements and from reading between the lines in the lives of saints, it seems that there are two fairly reliable tests – Does the person react violently to holy things (especially if these holy things are hidden from view), and does he have knowledge of events that he could not reasonably be expected to have? The Fathers in general pitied the mentally ill and possessed – and even at times admired them. St. Augustine speaks of the compassion of those who minister to “those whom they greatly love as if they were their children, or some very dear friends in sickness, or little children, or insane persons, at whose hands they often endure many things; and if their welfare demand it, they even show themselves ready to endure more …” (St. Augustine, 1980, p. 25). St. John Chrysostom says, “Physicians, when they are kicked, and shamefully handled by the insane, then most of all pity them, and take measures for their perfect cure, knowing that the insult comes of the extremity of their disease …. If we see persons possessed by devils, we weep for them; we do not seek to be ourselves also possessed” (St. John Chrysostom, 1978, p. 127). Chrysostom admires at least some of the possessed because “the demon makes men humble. … Great is the admiration it calls for, and many the praises, when struggling against such a spirit, they bear all thankfully …” (St. John Chrysostom, 1979a, p. 254). The Orthodox prayers of exorcism are remarkably gentle towards the possessed person. The prayers are directed to God, or they sternly command the demons; there are no harsh words for the demoniac. In one place, they even refer to the possessed as the Theotokos’s “faithful servant” (St. Tikhon’s Monastery 1999, p. 17). This is not to say that all the mentally ill were admirable. In various cases, the godless and the persecutors of the righteous became mentally ill as a result of their evil deeds. However, at least a few of them benefited from their mental illness. Nebuchadnezzar lost his mind because of his pride, but was restored to his senses and gave thanks to God. King Tiridates of Armenia became mentally ill as a result of persecuting martyrs, but later repented and became a saint (commemorated on November 29). In many other stories, though, the persecutors who became mentally ill never showed any repentance. In looking at these stories, though, we have to remember that they are from the “Lives” of saints; the writers were extolling the saints, not talking about mental illness. In short, the Fathers did not generally look on the mentally ill and possessed as the worst of sinners, but rather with compassion. At least some of these people seem to have developed great humility and thankfulness to God through their afflictions, and they are to be admired. In looking for references to insanity, we quickly found that most instances of terms related to insanity (e.g., mad, frenzied, irrational, beside oneself) were not applied to the mentally ill. At fi rst, we assumed that the Fathers were using these terms the same way we would off-handedly say, “That’s crazy,” or, “You’re nuts.” It became clear, however, that they were serious. For one thing, they accuse absolutely everyone who isn’t a saint (including Satan, Adam when he ate of the Tree, pagans, heretics, persecutors, and careless Christians) of being insane. Also, these accusations come up in very serious situations. All the Ecumenical Councils denounce heretics as insane. And many martyrs, after being accused of being insane, bring the charge on their persecutors. Neither the Fathers of the Councils nor the martyrs were taking “cheap shots.” They meant what they said. This makes sense if we think of an insane person as somebody who cannot perceive or respond correctly to reality. For many in our culture, this only refers to everyday reality. So the person who thinks that he is a gorilla is insane, but the 9/11 terrorists – who thought that they could go to heaven by killing thousands of innocent people and committing suicide in the process – are considered sane because they were just acting on beliefs held by their entire subculture. To the Fathers, both are insane. But the terrorists are insane in a very different and far worse way. They are wrong about the most fundamental reality – about the God Who loves Man so much that He sent His Son to die for us. So, everybody who still sins (i.e., everybody except the saints) is insane because we are acting against God, Who is the fundamental reality. And the more we take sin in stride, the more insane we are. After all, the person who is just a little crazy more or less knows it. But the person who is seriously insane thinks that everybody else is! Once we start to take sin seriously, we can understand why Church Tradition views those who are willfully enslaved to their passions as more seriously insane than the mentally ill. But, shockingly, even demonic possession is less serious. St. John Chrysostom discusses this in the strongest terms. A demon certainly will not deprive us of heaven, but doth in some cases even work with the sober-minded. But sin will assuredly cast us out. For this is a demon we willingly receive, a selfchosen madness. Wherefore also it hath none to pity it [i.e., willful sin] or to pardon it (St. John Chrysostom, 1979c, pp. 539, 540, emphasis added). [Regarding Judas:] For what would the madman do like this? He poured not forth foam out of his mouth but he poured forth the murder of his Lord. He distorted not his hands, but stretched them out for the price of precious blood. Wherefore his madness was greater, because he was mad being in health (St. John Chrysostom, 1978a, p. 488, emphasis added). So, willful sin is much worse than mental illness or demonic possession, because it is a free choice. The possessed (and, we can assume, the mentally ill) are in a good place to develop humility and thankfulness. Obviously, the willfully sinful are not. Demons are in a true sense internal to those enslaved by passions. In St. John Cassian’s “Second Conference of Abba Moses,” Abba Serapion relates how, while “still a lad and stopping with Abbot Theonas,” he would hide a biscuit in his clothes and eat it later in secret. When he finally succeeded in confessing his sin, Abba Theonas said, “Without any words of mine, your confession frees you from this slavery.” While Abba Theonas was still speaking a burning lamp came from Abba Serapion’s habit and “filled the cell with a sulfurous smell.” Abba Theonas then said, “Lo! the Lord has visibly confirmed to you the truth of my words, so that you can see with your eyes how he who was the author of His Passion [i.e. the Devil] has been driven out from your heart by your life-giving confession” (St. John Cassian, 1978, pp. 312, 313). The more subtle demons attack the soul, while the others hold the flesh captive through their lascivious enticements... When grace does not dwell in a man, they lurk like serpents in the depths of the heart, never allowing the soul to aspire towards God. But when grace is hidden in the intellect, they then move like dark clouds through the different parts of the heart, taking the form of sinful passions or of all kinds of day-dreams, thus distracting the intellect from the remembrance of God and cutting it off from grace (Ibid., No. 81, p. 282). So long as the Holy Spirit is in us, Satan cannot enter the depths of the soul and remain there …. Again, so as to teach us once more that it is through the body that Satan attacks the soul which participates in the Holy Spirit, he says: “Stand, therefore, having girded your loins with truth … (Eph. 6:14–17). When, because of the presence of grace, Satan can lurk no longer in the intellect of those pursuing a spiritual way, he lurks in the body and exploits its humours, so that through its proclivities he may seduce the soul... The intellect cannot be the common dwelling- place of both God and the devil. How can St. Paul say that “with my intellect I serve the law of God, but with the flesh the law of sin” (Rom. 7:25), unless the intellect is completely free to engage in battle with the demons, gladly submitting itself to grace, whereas the body is attracted by the smell of mindless pleasures? He can only say this because the wicked spirits of deception are free to lurk in the bodies of those pursuing a spiritual way (Ibid., No. 82, pp. 282-284). This is great news for the possessed and mentally ill, but it can be a recipe for despair for the rest of us. What hope do we have if we’re better off being enslaved to demons than to our passions? He that wrestles is still held fast, but it is enough for him that he has not fallen. When we depart hence, then, and not till then, will the glorious victory be achieved. For instance, take the case of some evil lust. The extraordinary thing would be, not even to entertain it, but to stifl e it. If, however, this be not possible, then though we may have to wrestle with it, and retain it to the last, yet if we depart still wrestling, we are conquerors (St. John Chrysostom, 1979b, p. 162). Augustine, Saint. 1980 (Reprint). “Our Lord’s Sermon on the Mount, According to Matthew.” Translated by William Findlay. In Vol. 6 of The Nicene and Post Nicene Fathers, First Series, Edited by Philip Schaff. Grand Rapids, MI: Wm. B. Eerdmans. Cassian, Saint John. 1978 (Reprint). The Conferences of John Cassian – Second Conference of Abbot Moses. Translated by Edgar C. S. Gibson. In Vol. 11 of The Nicene and Post Nicene Fathers, Second Series, Edited by Philip Schaff and Henry Wace. Grand Rapids, MI: Wm. B. Eerdmans. Chrysostom, Saint John. 1978 (Reprint). “The Homilies of St. John Chrysostom, Archbishop of Constantinople, on the Gospel of St. Matthew.” Translated by M. B. Riddle. Vol. 10 of The Nicene and Post Nicene Fathers, First Series, Edited by Philip Schaff. Grand Rapids, MI: Wm. B. Eerdmans. -------- 1979a (Reprint). “The Homilies of St. John Chrysostom, Archbishop of Constantinople, on the Acts of the Apostles.” Translated by J. Walker and J. Sheppard and Revised by George B. Stevens. In Vol. 11 of The Nicene and Post Nicene Fathers, First Series, Edited by Philip Schaff. Grand Rapids, MI: Wm. B. Eerdmans. -------- 1979b (Reprint). “The Homilies of St. John Chrysostom, Archbishop of Constantinople, on the Epistle of St. Paul the Apostle to the Ephesians.” Translated by Gross Alexander. In Vol. 13 of The Nicene and Post Nicene Fathers, First Series, Edited by Philip Schaff. Grand Rapids, MI: Wm. B. Eerdmans. -------- 1979c (Reprint). “The Homilies of St. John Chrysostom, Archbishop of Constantinople, on the Epistle of St. Paul the Apostle to the Romans.” Translated by John A. Broadus. In Vol. 11 of The Nicene and Post Nicene Fathers, First Series, Edited by Philip Schaff. Grand Rapids, MI: Wm. B. Eerdmans. Climacus, Saint John. 1982. 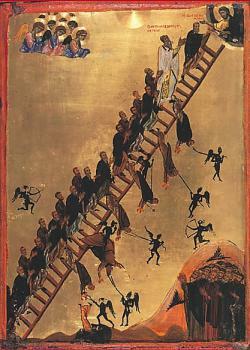 The Ladder of Divine Ascent. Translated by Colm Luibheid and Norman Russell. In The Classics of Western Spirituality: a Library of the Great Spiritual Masters. New York: Paulist Press. Diadochos of Photiki, Saint. 1979. 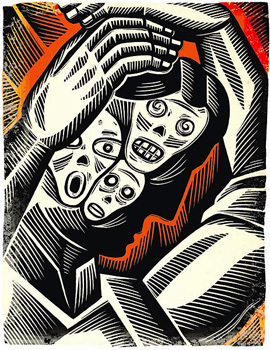 “On Spiritual Knowledge and Discrimination: 100 Texts.” In Vol. 1 of The Philokalia: The Complete Text. Translated and Edited by G. E. H. Palmer, Philip Sherrard, and Kallistos Ware. London: Faber and Faber Limited. Saint Tikhon’s Monastery, Translators. 1999. The Great Book of Needs: Expanded and Supplemented. Vol. 3, The Occasional Services. South Canaan, PA: St. Tikhon’s Seminary Press.